[ Ru | Es ] Minister of Economy and Trade of the Republic of Kalmykia Zoya Sandzhieva: Republic of Kalmykia planning to organize “first aid” for entrepreneurs, reported KalmykiaNews. In the Soviet era, Vladimir Sengleev engineer at a defense plant “Star” in Elista, capital of blessed Kalmykia. In 1993-1995 Vladimir Sengleev was engaged in private business, was the manager of JSC “Investment fund “Your dividend” in Kalmykia. Vladimir Sengleev one year teaching at Kalmyk State University. Official News: Head of the Republic of Kalmykia Alexey Orlov has appointed new Ministers. Andreev Nikolai Bovich appointed Minister of Land and Property Relations of the Republic of Kalmykia. 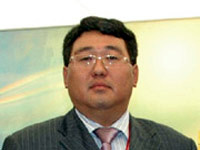 Boldyrev Erdeni appointed Minister of Economy and Trade of the Republic of Kalmykia.